I have a few pieces in the upcoming "NO-TIE GALA" at this years Kaleido festival. 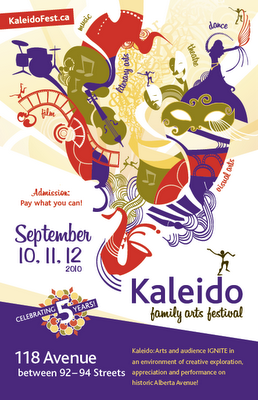 Kaleido celebrates artist and audience with music, dance, film, theatre, visual & literary arts on historic Alberta Avenue. I'm particularly excited to have work in this festival, because I will be moving to the area this October. I plan on attending the party on Friday and hope to see you there! Click here for a full listing of all the events. View works of art for sale from over 50 visual artists in a multitude of mediums and styles. The art gallery located within the Old Cycle Building opens at 6 pm with a beer, wine and cheese reception, catered by Creative Quality Catering and Bistro and live performance by Edmonton’s very own Lionel Rault. Find the perfect handmade gift or painting at the Artisan Village located on 118th Avenue, as the party spills into the street with the Friday night Blues Party featuring Dr. Blu and the Kevin Cook Band.